Wait a minute – you thought that the goal of NaNoWriMo was to write 50,000 words in the month of November, which last you checked still has 30 days, not 14. And if you thought that, you’re absolutely right. When I decided, on a whim, to participate in NaNo this year, I thought that there was no way I would be able to write so much. To stay ahead of the game, it’s smart to write 2000 words a day. That’s a lot. Sometimes, in the throes of a brainwave, I’ve written that much, but could I keep it up for an entire month? And I know me: if I say I’m going to do something, I will pretty much kill myself to get it done. NaNoWriMo must have been created for the writers with too much time on their hands, and they just needed a project like this to challenge them and add some spice to their lives. Writing a 50,000-word novel in a month should be a cinch for them, right? Except that I don’t believe these mythical writers actually exist. For argument’s sake, however, wouldn’t it be easier for this kind of writer than it is for me – a busy, semi-working mom of two – to write a novel in the space of a month? In fact, I believe that simply having the skills and the time are not enough to get the job done here. I scoffed when I heard people talk about NaNoWriMo last year. I thought they were crazy, and I never saw myself participating in anything like this. It just spelled failure, something that I didn’t want to sign up for. Of course, I was the tired mom of an infant and a preschooler, and my creative side was just plain drained. I did muster my energy for some editing, but that’s much more a perfecting process with a little creativity on the side. And that was the problem: I did not have the enthusiasm or the motivation to do it. I was not inspired. Above everything else I did in the first 14 days of the month that allowed me to reach my goal early – even above carrying my laptop with me everywhere and typing every spare second – inspiration is what has carried me through, what has made it possible for me to write ridiculous amounts every day. And the inspiration didn’t hit me until October. I’ve read interviews of famous authors, in which they talk about what kind of music (if any) helps them write. I’ve read them try to explain where they get the impetus to write, which is nearly impossible to explain. I’ve read acknowledgements in novels that thank a particular rock band or attribute the desire to write to a favorite author. And it’s a combination of these and other artistic expressions that I believe form my own creative sustenance, as well as theirs. One night years ago, Thomas and I left the theatre after a movie, and a new scene for my novel du jour popped into my head. Vivid enough that I can still remember it today, I could not wait to get home and get it on paper. At that moment, jotting down the teenaged boy climbing a tree outside his friend’s window and throwing rocks until she appeared was my top priority. And you know what movie it was that inspired this? X-Men. Yes, X-Men. Were my characters mutants? No, although there were sci-fi elements to my story because that’s just how I roll. All that to say that the things that inspire me, as well as other writers, don’t have to have anything to do with the plot or the characters. They don’t have to make sense to anyone else, after all. There are songs that have done this for me, too, songs that I’ve listened to again and again because they evoked a particular scene every time I heard them. When I was a kid, I had a couple books filled with famous angel art that I flipped through when I needed an idea. These other artists’ modes of expression become my mantra when I need them. It drives my husband crazy because that often means seeing the same movie or hearing the same song again and again, but it’s the method to my writing madness. So in October I decided to go out on a limb and watch a movie that I had little hope for. It was based on a book I’d read and loved – the kind that kept me up until one or two in the morning a couple nights in a row. Not only was I pleasantly surprised with the movie version, but it reawakened that spark within me. Part of it, I think, was nostalgia, considering I’d enjoyed the book so much. But another part of it was a yearning from my creative side, which hadn’t been very active in a while. The problem I faced was that while I wanted to write, I wanted to write something new. I did nothing about it, though, just a whole lot of wanting. And then two days before NaNo, I got a tiny glimpse into a new character that made me think I could actually do this thing. It snowballed from there. I’m glad I didn’t have to wait longer than two days because the scenes building in my head all but overflowed onto the page on November first. I wrote over 4700 words, and although I didn’t keep up that kind of pace, I stayed inspired. I kept watching the movie that gave me that initial excitement about writing again, and my new story kept playing itself out in my head. One of the first bits of advice I received about conquering the 50,000-word requirement was to write a thorough chapter-by-chapter outline. I suppose this helps people add flesh to the skeletons of their stories, but to me, instead of being natural, it’s more of a Frankenstein’s monster kind of thing. In my experience, detailed outlines are the best way to kill creativity. They’re also very presumptuous. Authors who are scared or new to the craft use them because they want to control their novels. And believe me, I am a control freak. Having a guide is important. I write notes about what I would like to have in my story and where it’s important to introduce new characters and plot twists. But formal outlines that bind the story and leave it no room to grow are the best way to kill your creativity. This time, I’ve let myself get quite carried away on wave after wave of inspiration. Completely open to whatever may happen next, I write scenes as they come to me. Sure, there are many places where the narrative jumps around with absolutely no transition, but at this point, I’m not worried about making it pretty so much as just making it. The wonderful thing about allowing myself this kind of freedom with my writing is that it’s taken me unexpected places. Last Sunday night, a new scene barged in on me when I thought I was going to have a nice, relaxing 2000-word kind of night. This scene included new characters I’d never met and a circumstance that I certainly didn’t expect. It turned into a 9300-word writing fever – all in one sitting. I finally forced myself to go to bed. And I was amazed that it wasn’t nearly as late as I feared it would be. In the midst of that kind of outpouring, it doesn’t take as long to be productive as when you’re stuck trying to breathe life into a pre-determined plot point. I’ve heard from other NaNo-ers that week two is when you need pep talks because there’s apparently a slump. There actually was one night this past week when I didn’t even type 1500 words. I am slowing down a little and having to fill in those transitional scenes that have put so many of my stories into comas. Still, I managed to pass the 50,000-word threshold at the end of the dreaded second week. I have the feeling this novel will be well over 100,000 words (at least before I take out the ax, that is), and now is not the time to sit back and think, Well, I reached the official goal, so now I can relax. I will finish my book. I will write through the dead spots. I will keep enjoying my inspirational cues, however they happen, until I get the job done. I think I’ve said enough about process for now. It’s time to take a ride with my story. It’s November… Do You Know Where Your Story Is? 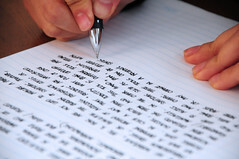 This entry was posted in Writing and tagged Creativity, Inspiration, NaNoWriMo, National Novel Writing Month, Writing. Inspiration from movies and songs, well that is a great source. All the best with your writing. I used to write outlines, and for my Emma series, I do have an outline of sorts, since there are so many books, and I want to make sure I don’t miss something. But I think of them more as road signs with lots of unknown twists and turns between them.